I'm using the IDAutomation barcode label software. 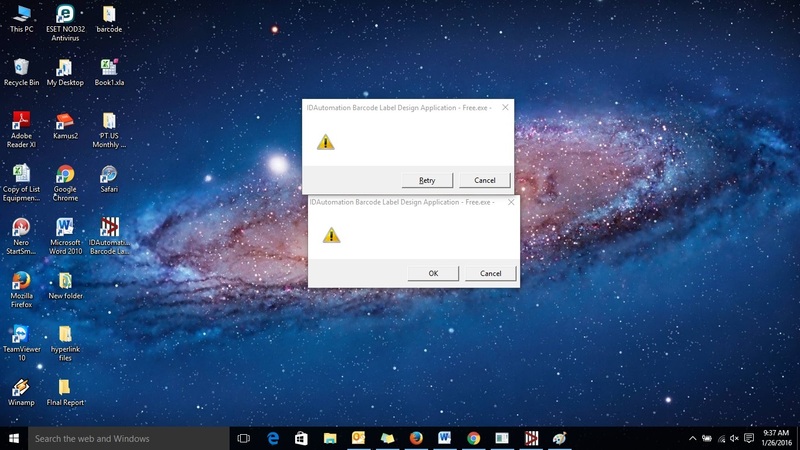 I using this software in Windows 10 frequently, but suddenly this software is unable to open the last 2 weeks and is always showing a popup screen to try again. Please help. Whenever I try to open, it shows a yellow color symbol and asking to try again. FYI: demo version will open and can create barcodes but I can't open the free label version. It is always showing error. What is the version number of the Barcode Label Software? If you are running an older version (before 2015 release), there may be issues. Try downloading the latest version of the Barcode Label Software. It is also difficult to see the error message. If you can provide a larger image or the error message, I may be able to identify the issue. Ben To look into the issue, attach a screen shot of the issue.